Single flow taps sit on the corner of your sink or worktop and are connected to a water filter to supply only filtered water. 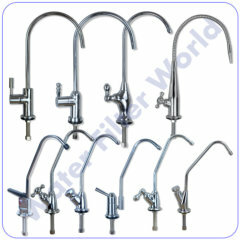 They are available with different style spouts such as swan neck, long reach, short reach & even a bendy spout. This stylish drinking tap range, are available with quarter turn lever handles, ceramic disks and flip leaver handles to suite your tastes and requirements. All of the water filter faucets are supplied with 1 meter of ¼” food grade John Guest flexible pipe for a simple connection to a water filter. We stock a large range of tap adaptors that can easily be fitted to the tap shank so the water filter tap can be fitted to other makes of water filter systems. So now you can always have your water filter on tap to provide you with great tasting water.